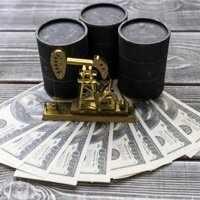 But Money Morning Global Energy Strategist Dr. Kent Moors – an oil industry veteran whose career as an energy advisor to U.S. and Russian governments stretches over four decades – says prices will stabilize in 2016 as annual demand increases 1.2%. That will end up reducing the excess supply. This chart shows the number of active U.S. oil rigs and how dramatically that number has fallen. 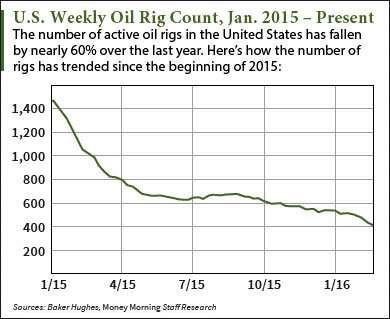 Since the first week of 2015, the number of U.S. oil rigs has declined 72% from 1,421 to 400. Baker Hughes Inc. (NYSE: BHI), the oil field services company that has reported the rig counts for 72 years, reported today (Friday) that this week's count is the lowest since December 2009. And Moors says the dwindling rig count will be one of the primary reasons oil prices rebound in 2016. You see, an average shale oil well produces most of its volume within its first 18 months online. The majority of U.S. wells are now starting to see a drop-off in production. That makes sense considering the crash in oil prices has been going on for just over 18 months now. "The U.S. rig count has declined precipitously… that can't help but lead to a drop in supply, especially when it comes to shale or tight oil," Moors said in December. "It's called the decline curve and can't be finessed forever." The falling rig count and increasing global demand will work together to stabilize oil prices this year. In fact, the West Texas Intermediate (WTI) crude oil price will double its current value by mid-summer. "By July 1, 2016, WTI should be at $66 and Brent at $70," Moors forecasts. "By the beginning of the fourth quarter, WTI at $68, Brent at $72." Alex McGuire is an associate editor for Money Morning who writes about energy. Follow him on Twitter for the biggest oil price updates.